I spent most of my visit to Hanoi in 2005 totally freaked out by the traffic. For starters, there were barely any traffic lights, and any that did exist were customarily ignored by drivers with barely any concept of road rules. Not only was crossing the wide road intersections (filled with 10 lanes of traffic) about as relaxing as jumping into a pit of wolves – the traffic never stops, EVER – but walking on the pavements was also fraught with peril. Every few seconds a massive motorbike would roar a hair’s breadth alongside us, aided by specially-made metal ramps to ease their trajectory onto the pedestrian’s path. I trembled with panic on every street, gingerly picking my way along, clinging to my husband like an old biddy. Get me, Mrs Adventuresome! The only reason I managed to cross any roads at all was a) thanks to my husband for dragging me across while I shrieked with fear and b) the elderly ladies and gents who I used as ‘body padding’ by crossing the road at precisely the same time as them, next to them, knowing that they would get more respect from any drivers than a pale, lardy foreigner such as I. It worked every time. Traffic in the Vietnamese cities has to be seen to be believed – old doddery folk brandishing walking sticks walk slowly but fearlessly out into the seething morass of tuk-tuks, motorbikes and lorries, as the traffic weaves around them. The trick is to never slow your walking pace: hesitate at your peril! Unless it’s had a makeover post 2005, the restaurant is pretty low key. You ascend a narrow staircase to find yourself in a narrow dining room filled with formica tables and the heady scent of fish and dill. Heads are bowed over delicious food. Waiters bring hot stove burners to each table and individually wok-fry the dish in front of you, sizzling and fragrant, the chilli tickling your nostrils. You ease the heat in your throat with cold local beers. There are no frills. You pay in cash. There is no website. 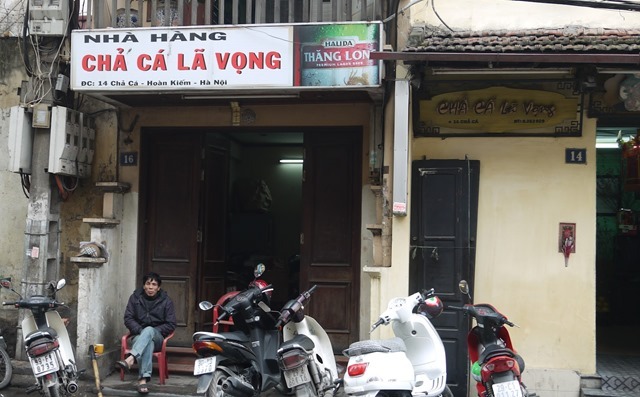 Eating here was a definite highlight of my stay in Hanoi. 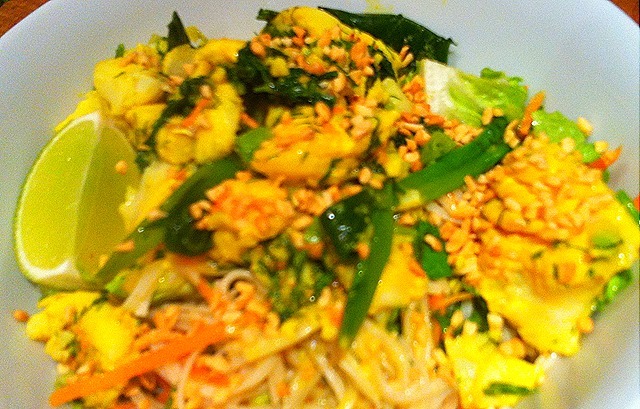 Since then, I have been experimenting with my own versions of Cha Ca La Vong at home. 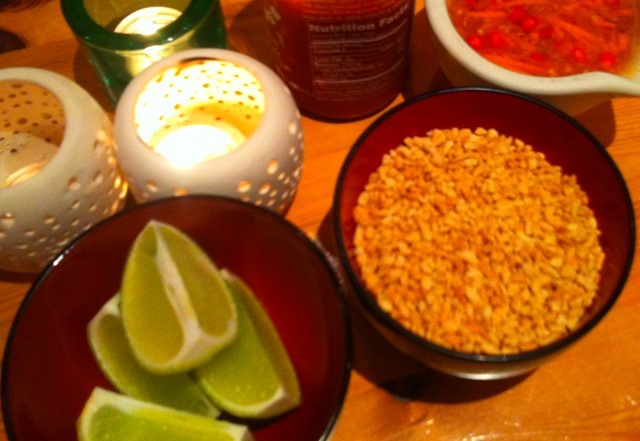 The traditional way to serve it is to have individual bowls of fresh herbs, peanuts and a plate of rice noodles on the table that guests help themselves too, before topping with the hot stir-fried fish. 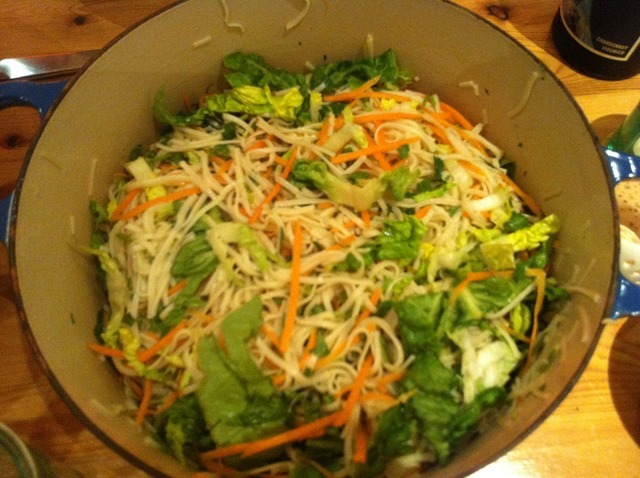 As it’s a dish that needs to be eaten straight out of the wok, immediately, I find that if you’re making it for guests, it’s good to serve as a one-bowl dish with the noodles underneath. That way, nothing gets cold on the table. Also, I’m too short of time and not organised enough to have rice noodles sitting on the table that don’t go cold and stick together. Too much pfaffing already! So, I’m probably committing sacrilege, but this is my simplified version of Cha Ca La Vong – and it’s no less tasty for not being served completely the traditional way. 700g firm white fleshed fish cut into large chunks (I used line-caught cod, but you can also use monkfish) In Vietnam, catfish fillets are more commonly used, but I don’t think you can easily find these in England. You can also add a tsp or two of sugar, but I find you don’t need it. 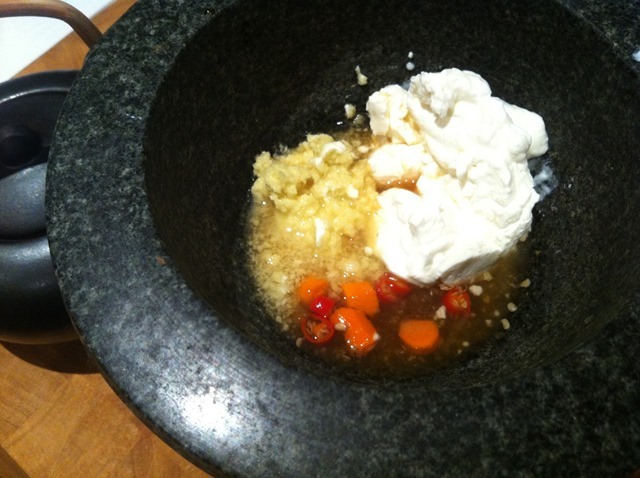 Dressing for the noodles: 5 tbsps fish sauce, 1/2 tbsp sunflower oil, juice of 1 lime, 1 crushed clove garlic, 3 chopped birdseye chillies, 1/3 cup water – just gently whisk everything together. Make the marinade by either pounding everything together in a pestle and mortar, or whizzing up in a food processor – you’re aiming for a ‘smoothie’ consistency. Marinade the chunks of fish just 30 minutes before you want to cook – don’t leave any longer, because the vinegar will ‘cook’ the fish. Get two shallow pans on the heat (I used a wok and a frying pan) and fry the spring onions in a couple of tablespoons of sunflower oil until slightly softened. Then add the marinated fish in such a way that the pieces aren’t touching each other too much – turn them only once as you don’t want them to break apart too much. Add the dill to soften, gently stir it in. A couple of minutes should do it. Serve the fish quickly on top of the dressed noodles in large bowls – sprinkle with toasted crushed peanuts and squeeze over a wedge of fresh lime per bowl. 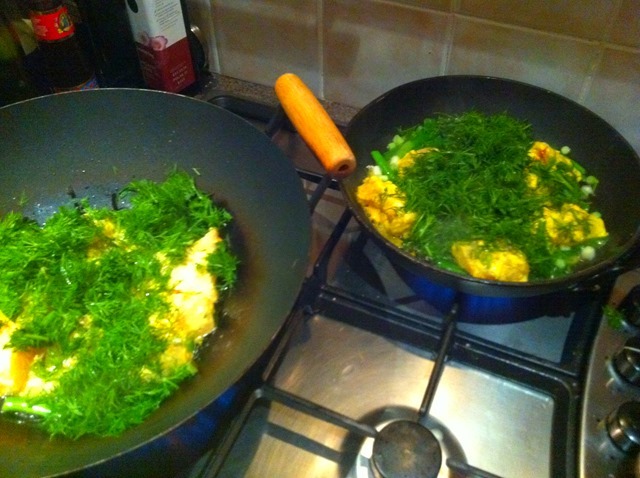 It’s a total flavour revelation – woody spiciness, fiery ginger and fragrant dill all complement the fish beautifully. A dish to make again and again! *The reason I had to nick a photo from another site was that all the pictures I took at the time of my trip to Vietnam were with good old-fashioned film, so I have no digital images! I wish I could go back…one day eh? Thanks to Smitten by Food. We are making this right now!